GWF outcomes will be achieved through three interrelated pillars of activity. 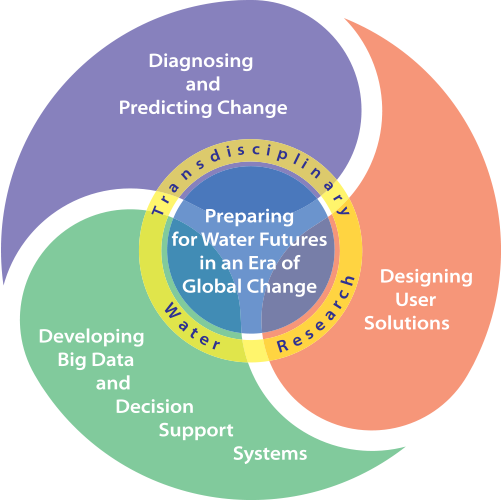 GWF develops transdisciplinary and integrated science, focused on user needs, and computer simulation models to enable improved water scenario forecasting. This work encompasses five foundational science themes and the interactions among them: impact of climate change on weather and extreme precipitation (hydro-meteorology and climate change); effect of climate change on water stores and flows and land ecology (hydrology and terrestrial ecosystems); impact of climate change and land use on water quality and ecosystem health (water quality and aquatic ecosystems); impact of human actions and management on water futures (human-water systems - integrating complex environmental change with human impacts and responses); and impact of climate change on human health (water and health). GWF integrates natural sciences, engineering, social and health sciences with big data and decision support research to deliver new water science and transformative modelling tools for improved understanding and prediction of change in the world’s cold regions. And GWF provides the science and underpinning computer models for development of risk management solutions, exploiting new observational tools to deliver the new interdisciplinary science needed to manage change. Directed by the needs of our users, GWF diagnoses past change and develop new models with enhanced power to predict water flow and ecosystem regime shifts. Hydrometeorology and Climate Change will improve understanding of how climate change influences water availability and extreme events, and develop knowledge foundational for understanding subsequent impacts of climate change on water. Hydrology and Terrestrial Ecosystems will improve understanding of how hydrological and terrestrial ecological processes will co-evolve under a changing climate, providing critical information on landscape and water futures. Water Quality and Aquatic Ecosystems will improve understanding and predictive modeling of how changes in climate, hydrology, and land use impact water quality and the health of aquatic ecosystems in cold regions, including Canada’s large lakes. Human-Water Systems will address the human dimensions that will determine water futures by: (1) integrating human behaviour, economic valuation, and policy decisions into water resource models, (2) building adaptive governance models to deal with problems of uncertainty, (3) developing and testing economic tools and incentives for managing water futures, (4) conducting basic social science research into the social processes and learning embedded in stakeholder engagement, and (5) building an indicator system that enables benchmarking performance for governance deficiencies, policy transfer, and social learning. 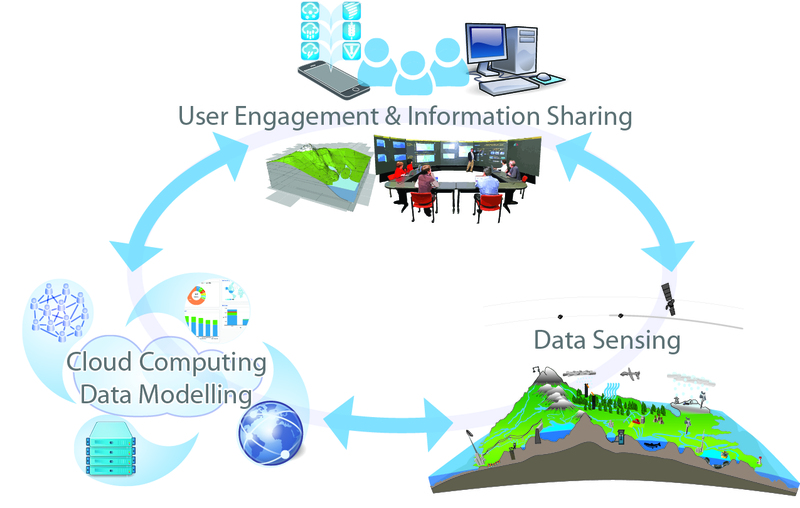 This work exploits the power of information technology and novel observations to develop water data, models and visualisation systems needed to deliver water information and decision support tools to user communities and the public. GWF develops new capabilities for cold region water observation and monitoring by creating world-leading, multi-scale watershed observatories and expanding watershed monitoring through development and use of new sensors and observing systems and cloud-based data and modelling tools. Big Data for Water delivers transformative new capabilities for observation, focussed on development of our world-leading multi-scale observatories. 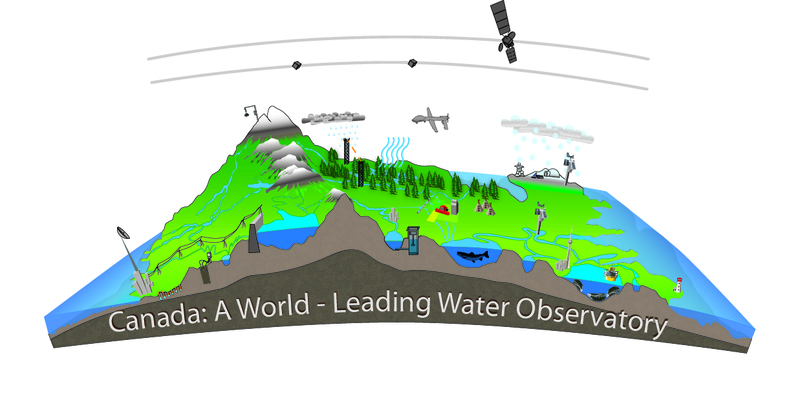 Through small catchments instrumented with hundreds of observation stations within our large river basin observatories, GWF diagnoses environmental change in key biomes and develop the large-scale science associated with global-scale modelling, land-atmosphere feedbacks and landscape change. These observatories also provide a key platform for science integration to address management/ governance dimensions. Decision Support Systems develops next generation decision support tools, visualisations and apps that will give our stakeholder communities targeted, user-friendly access to the capabilities of our novel data and modeling tools. Guided by our users, GWF provides tools and solutions that Canada and similar cold regions currently lack, but urgently need, to manage the water environment in the face of unprecedented change. Enabled by new data, analyses and models developed in our other two pillars, GWF delivers water futures information and “decision support tools” to communities of users and the public by developing the data access, models and new visualisation and interactive decision-making systems (such as “decision theatres”) that these groups need to predict and manage risk.